The “Desperate Journeys” report states that 40 per cent fewer of those on the move, entered Europe via the Mediterranean this year, compared with 2017. An overall increase in those arriving in Spain and Greece was more than offset by significantly lower arrivals in Italy. 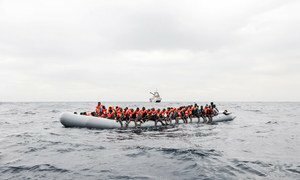 The drop in numbers successfully reaching Europe, has been attributed to increased support for the Libyan Coast Guard to prevent sea crossings, and further restrictions on NGOs involved in search and rescue missions. The three European entry countries for those crossing the Mediterranean were Spain, Italy and Greece and, by the end of July, Spain had become the primary entry point to the continent. The majority of refugees and migrants for each respective entry country came from Guinea, Tunisia and Syria (during the same period in 2017, the top three nationalities were Nigerians, Guineans and Ivoirians). Libya, the principal country of departure, has received support in establishing its own search and rescue region, which has resulted in more people being intercepted or rescued at sea by the Libyan Coast Guard and returned to Libya. NGOs and others conducting rescues in the central Mediterranean Sea are facing increasing difficulties finding safe European ports for disembarkation: Italy has refused to allow the disembarkation of several NGO vessels carrying rescued refugees and migrants, since early June. These measures have been accompanied by a sharp rise in the rate of deaths. In the Central Mediterranean, one in 18 of those who crossed to Europe between January and July 2018 went missing. The rate last year was one in 42 of those attempting the crossing. This year has already seen ten incidents in which 50 or more people died, seven of which occurred since June. 300 people have died attempting to reach Spain from North Africa; a third more than 2017. On land, there have been more than 78 recorded deaths of refugees and migrants in Europe or at Europe’s borders, compared to 45 during the same period last year. Here, police and border authorities are alleged to have pushed back refugees and migrants to a neighbouring territory, using violence in some instances, often denying them access to asylum procedures. UNHCR, together with the UN Migration Agency, IOM, is calling for a predictable, regional approach for the rescue and disembarkation of people in distress in the Mediterranean Sea. The Agency is urging European States to grant those seeking international protection readily-available access to asylum procedures and increase access to safe and legal pathways for refugees to enter the continent. It also appeals to States to do more to protect people with specific needs, in particular children travelling alone. UN Refugee Agency chief Filippo Grandi, on Thursday gave a cautious welcome to the decision by several EU countries to take in some 450 migrants who have been stranded at sea for days, warning that a “ship-by-ship” arrangement was not sustainable. The head of UN Migration Agency (IOM), William Lacy Swing, has urged Libya to stop detaining migrants who have been returned to the country’s shores after trying to cross the Mediterranean Sea to Europe.